When I started this grieving dad’s journey back in 2004, I didn’t realize I would loss another child just 18 months later. I also didn’t realize it would send me down a path that almost destroyed me mentally, physically, spiritually and financially. I was a lost soul trying to fight my way out of a hole that I was thrown into without any idea or tools on how I would survive. When I started to look around for someone that had survived this nightmare that could help me, anyone, I came up empty. But then I started to dig a little deeper, casted a wider net and started looking outside my comfort zone. Once I started to connect with others and studied what I was dealing with, the panic started to subside although the pain didn’t. Fast forward to late 2009 when I started down another path that I had no idea would lead me to a sense of purpose and personal reward. That was when I made the decision to launch GrievingDads.com to see if there were other dads out there in the same hole I found myself in. I knew within a few days that there were many of us lurking in the shadows begging for someone to throw them a lifeline. I decided at that point that I was going to try to be that lifeline. I am sure at times my message has been the glimmer of hope for some and at other times not so much. The launch of my Grieving Dads book in 2012 took a lot of energy and resources to launch, but it was we’ll worth the time, tears, pain and energy that it took to capture the pain that we all endure. I did this with the help of 1000’s of other grieving dads that were selflessly willing to share their stories and their deep dark experiences with this unfathomable loss. This book has saved lives based on feedback I have received from the grieving dads that have read it. It has also giving me a purpose and drive in my life that I thought I would never recover. It’s been tremendously rewarding and heartbreaking all at the same time. In February, I started working with an individual that was skilled in developing workbooks/participant manuals. Since that time, I now have a draft version of the Grieving Dads Participants Guide that can be used in conjunction with the Grieving Dads book to help facilitate thoughts amongst individual readers and discussion amongst a group of grieving dads. It was designed to be used by individuals and to help leaders of grieving dads support groups that can be set up by fellow grieving dads. My goal is to officially launch this by the end of the year. 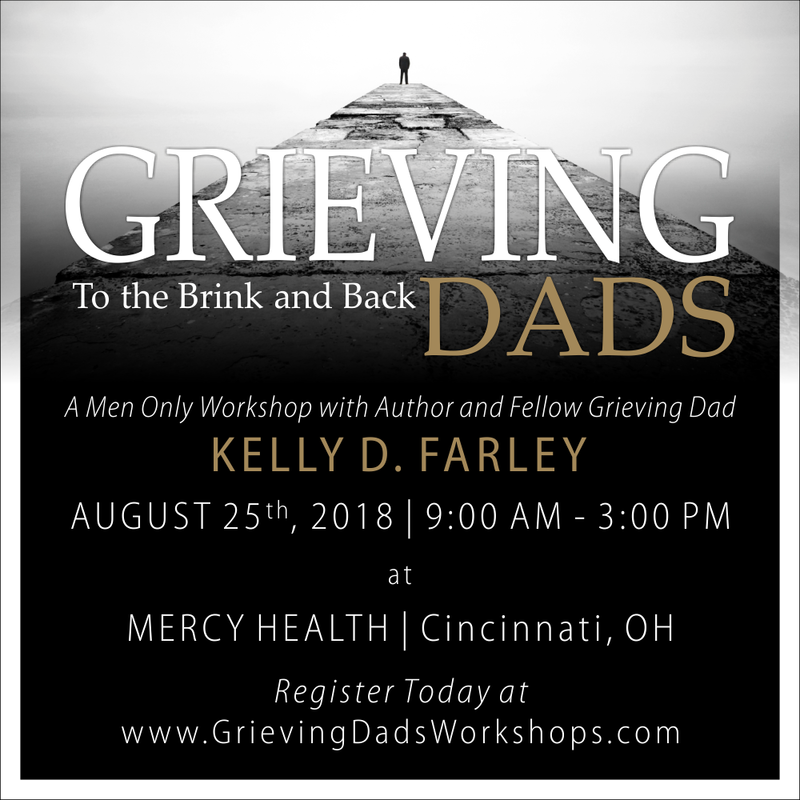 In May of this year, I started to design a 1-day workshop that I would present to fellow grieving dads with the goal of presenting the very first workshop sometime in 2018. The workshop was designed to breakdown each chapter of my book that I would be presented to a group of grieving dads. It will be hard hitting, insightful, powerful and informative. It is with great pleasure and excitement that the final arrangements have been made for the very first Grieving Dads Workshop. It will be held in Cincinnati on Saturday, August 25th from 9am – 3pm. I will be presenting this workshop and I will be bring my experiences and other lessons I’ve learned from speaking with thousands of other grieving Dads. I want to invite you to join me for this day of insight and connection with fellow grieving dads. Since this is the very first event, I have limited the amount of attendees so I can get a feel of how the event is received. Tickets are available for $50 (which includes continental breakfast, lunch and a copy of my book) and on a first come basis. I encourage you to RSVP as soon as possible. I know I have heard from many of you over the years and I would love to speak meet each one of you if you can make it. Go to www.GrievingDadsWorkshops.com to get your ticket(s). Call me at (630) 561-5989 or email with any questions or comments. If cost of the ticket is a challenge for any grieving dad that would like to attend, please don’t hesitate to contact me, as a few comp tickets are available for those in need. If you can’t make Cincinnati, you can still attend one of these events. If you are interested in me conducting my workshop in your town, please reach out to me so we can discuss that possibility. My goal is to conduct one of these events per month starting later this year and into 2019. Please forward this information to other grieving Dads, grandfathers or brothers that may want to attend. Thanks to our sponsors: Mercy Health and The Lovis Foundation. My wife forwarded me this opportunity. Unfortunately being in Maryland will not allow me to attend this event even though I would really like to. I am sure I would get a lot of knowledge and help from it. I am still in the very early stages of this journey as my wife and I lost our son back in September 2016 almost 2 years. But everyday feels like it was just yesterday. Is there any way that perhaps I can obtain a copy of your book or other materials you will be providing at the event? Also, will you be in the Maryland, Pennsylvania, DC or Virginia area any time in the future? I could definitely do a day trip then. Thank you. This is awesome, Kelly. Keep up the great work. I cannot attend Cincinnati, but if you are planning one in Southern California, I would attend. If the comp tickets go quickly, I am willing to donate for a father that cannot attend, due to a financial restriction. Greg – Thanks for you generous offer. I will certainly let you know when I will be in Southern California. Kelly what you are doing with this new venture and all the things in the past is just great. It just so happens that next week is the 8th anniversary of my daughter Jeanne’s death. I have been a bit out of sorts this past week and my wife wonders if it because subconciously, I am dreading this anniversary coming up again. Regardless, keep it going. Lot’s of us out here don’t say much – but we are blessed with your conviction in helping us all get through this and to not feel alone in our pain. Steve – Thanks for the kind word regarding my new venture. Be patient with yourself over the next week, those days sneak up on us in ways we will never fully understand. I would have liked to attend, but with fairly short notice I have plans already that weekend. Please let me/us all know when and where the next one would be so that i may try attend that one instead. We’ll catch next time. I plan on doing a lot more of these. I hope we can fill the 50 seats. Kind of a slow start to sign ups. I’ve had 160+ people click on the event and only 2 sign up. There may not be the need I thought there was, but we will see. Have you thought about live-streaming the event? You could reach people beyond the city that way.